Claire Boucher is the brains behind Grimes, an audio-visual project that’s spawned two acclaimed albums and an equally lauded EP in the past two years. We caught up with the Canadian multi-instrumentalist to find out all about new album Visions and the influences behind her experimental electronic-pop. So Claire, how would you describe your music to someone who’d never heard it before? Your last album Halfaxa received some amazing reviews. Did you feel any pressure to match that acclaim when writing Visions? And how important are the opinions of the critics to you? I actually don’t read any of my press so I don’t really know what people say. ‘Cause, y’know, if any time anyone says anything mean I just get so depressed. But personally, I was definitely like, “This album needs to be way better than Halfaxa”. I mean, I need to know in my heart it’s a progression. But I think it is! I don’t want to be just some hype band. Even if everyone f***ing hates me and forgets about me, I’ll still be making great music. This is your third album in less than two years. Are you naturally prolific or do you have a strict work ethic? I think I’m pretty naturally prolific. I mean, given any free time and privacy, I’ll probably just make music. We read that the new record was conceived during “a period of self-imposed cloistering”! Was the experience of writing and recording Visions enjoyable?! (Laughs) It was equally enjoyable and tortuous but I feel like the fact that it was really hard was part of the reason that it was really good, y’know? I definitely look back on that time with fond memories, even though I remember crying and being like “I hate everything!” at the time! (Laughs) But I recorded it in my room in Montreal and it was a really good way to work. What was your goal for the record, and do you feel you’ve achieved it? To us, Visions seems to have a more cohesive focus than Halfaxa, rooted in dance music. Would you agree? Yeah! I mean, I don’t know to what extent Halfaxa is a “record”, y’know? I just made a bunch of music at a period and at one point I was like, “Well, this is pretty long, I should probably cap it here…” and it was done. Whereas with Visions, I sat down and recorded the whole thing in three weeks and then I was like “Done. It’s a record”. So I feel like it’s way more cohesive. What were your key musical reference points when writing the record? I don’t really think about that stuff until after the event. But as far as the music I was listening to, [it was] a lot of K-pop, a lot of R&B and new jack swing, and a lot of dance stuff and IDM, like Aphex Twin and Boards of Canada. If you had to pick one track on the album you’re most proud of, which would it be and why? Probably the song ‘Be A Body’. I spent the most time on it. With most of the other songs, I started them, I recorded them and I finished them; they were a one-day kinda thing. With that song I can feel the evolution in it: it started out one way and kept changing. I don’t know, maybe it doesn’t mean anything to anyone else, but to me it’s the most fleshed-out and the most telling of what the future of Grimes is gonna be like. It’s either the last or second to last song I finished on the record and it feels the most advanced. One of the most striking things about your music is your voice and the way you use production methods to distort and play with it. How important are lyrics to you and are you trying to convey a message? I’m really inspired by a lot of strong women in the Canadian scene, like Megan from Purity Ring and Raf from Braids/Blue Hawaii. And then definitely artists like How To Dress Well, with the R&B thing. I know him pretty well too, so that’s been pretty big for me. I just have a lot of friends that make really great music that I really identify with. I used to live with Raf actually, but that didn’t work out. 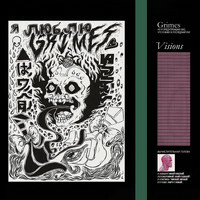 Grimes is an audio-visual project: which art form do you most enjoy expressing yourself in and why? And are you interested in exploring the creative possibilities of fusing technology and music, like Björk did with her Biophilia app? Definitely music. Just because it’s so expressive, it feels great when I’m making it and my greatest experiences from art have all been from music. Also, I foresee the most potential for innovation in music, and it’s the most emotional and the most rewarding. I definitely don’t want to do anything that requires an iPad. I mean, I’m interested in my own personal exploration of music but when I’m done with it, it’s done and that’s what people are going to hear. You’re signed to 4AD for the worldwide release of Visions, but you’re part of the Arbutus Records collective in Canada. How have Arbutus influenced your development as an artist? Grimes wouldn’t exist without Arbutus! (Laughs) ‘Cause when Arbutus first started, one of the guys who runs it was like, “Claire! Make a record!” and when I was making it he would always call me, saying “Claire, when’s the record done? !” and I’d be like, “Oh my god… I can’t believe I have to do this!” So I made my first record because I was basically forced into it! Which was great in hindsight. And then once that started getting success I thought, “Maybe I should do this…” But if that had never happened I just would never have made a record. I mean, it was something I always wanted to do but I was just way too embarrassed to. The thought of singing in front of people was just so mortifying! But now I’m really happy that I’ve done it. What were the key records that first made you want to become a musician? Oh god, um, Stankonia by Outkast, Feels and all that Animal Collective and Panda Bear stuff, everything Burial’s ever done... Oh, there’s so many! That Physical Therapy remix of Alicia Keys’ ‘Unthinkable’ was mind-blowing for me. Because I was like, “Why are there no R&B singers that are crazy producers?! There should be crazy, weird, scary R&B music; I can’t believe it doesn’t exist!” So I wanted to be the person to actually do that, instead of it always being remixes. What are you most proud of in your career so far? And what are you most excited about in the next twelve months? Probably the song ‘Be A Body’; I think it’s the best thing that I’ve done. And this year I’m looking forward to touring Asia or Africa. I don’t know exactly where we’ll be going yet but we’re organising it right now. And what do you hope to achieve ultimately with Grimes? I just want to keep making innovative music. I don’t want to be just some hype band. I mean, even if everyone f***ing hates me and forgets about me, I’ll still be making great music, and that’s all I really care about. I would rather have a very small number of people know who I am but be considered important, than be really famous but just another musician.